Study shows that deforestation, loss of biodiversity and economic damage done to communities living near dams have not been factored into the cost of these projects. Large dams also ignore the effects of climate change. While most developed countries have reduced the construction of large dams for the production of electricity in recent decades, developing countries, including Brazil, have embarked on even more massive hydropower developments. These countries have not accounted for the environmental impacts of large dams, which include deforestation and the loss of biodiversity, or the social consequences, such as the displacement of thousands of people and the economic damages they suffer. These effects should be computed in the total cost of such projects. Worse still, these projects ignore the context of climate change, which will lead to lower amounts of water available for storage and electricity generation. The warning comes from an article by researchers at Michigan State University in the United States published in Proceedings of the National Academy of Sciences of the United States of America (PNAS). The lead author is Emilio Moran, a visiting professor at the University of Campinas (UNICAMP) in São Paulo State, Brazil, and the principal investigator of a research project supported by São Paulo Research Foundation – FAPESP under the São Paulo Excellence Chair program – SPEC, which is designed to study the social and environmental impact of Belo Monte hydropower development near Altamira, Pará state. “We argue that if the construction of large dams in developing countries is to continue, it must always be preceded by a painstaking assessment of their real cost, including the environmental and social impact they have,” Moran told. According to the authors of the study funded by FAPESP, hydropower is the leading source of renewable energy worldwide, accounting for as much as 71% of the total in 2016. Developed countries in North America and Europe built thousands of dams between 1920 and 1970 but then ceased to do so because the best sites had already been developed and environmental and social concerns made the costs unacceptable. Many large hydropower developments in these countries are now at the end of their working lives, and more dams are being removed than built in North America and Europe. In the US alone, 546 dams were dismantled between 2006 and 2014, according to the article. “The cost of removing a dam once its useful life is over is extremely high and should be taken into account when computing the total cost of a new hydro development,” Moran said. According to Moran, the first dams were also built in North America and Europe to supply power to rural areas and provide water for irrigation systems. “These projects had a social purpose,” he said. In contrast, the dams now under construction along the rivers of the Amazon basin in South America, on the Congo River in Africa and on the Mekong River in Southeast Asia are mostly designed to supply power to steelmaking companies, for example, without benefiting local communities. The most emblematic case is the proposed Grand Inga Dam on the Congo River at Inga Falls, the world’s largest waterfall by volume. The dam could increase the total amount of power produced in Africa by over a third and will export electricity to South Africa for use by the mining companies there. “The people affected by these projects reap no benefits, such as access to electricity or a cheaper power supply. In the case of Belo Monte, the transmission line passes over the heads of the people affected and takes the electricity generated straight to the south and southeast, two of Brazil’s wealthiest regions,” Moran said. According to the study, in the case of Belo Monte, as well as Santo Antonio and Jirau, which have recently been built on the Madeira in the western Amazon, the electricity bills for the nearby communities have gone up rather than down. Moreover, the jobs promised to locals when construction began went mostly to outsiders and disappeared within five years. “The inhabitants of Altamira supported the construction of Belo Monte before it began because they thought it would bring the town huge benefits. No one supports it now because hydro development has destroyed their peace and quiet. It has brought only problems for most people,” Moran said. In addition to the problems they cause downstream communities, serious environmental damage is also being wrought by the new dams under construction in South America, Africa and Southeast Asia. In the Amazon basin, where 147 dams have been planned in a 6 million square kilometer (km²) area, including 65 in Brazil, hydropower developments have affected fish populations and dynamics in a region with some 2,320 species of fish. 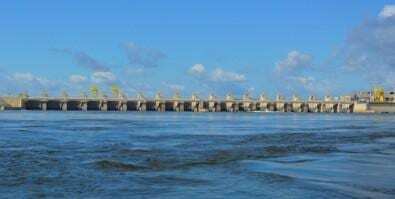 The number of fish in the Tocantins, which drains into the Atlantic near the mouth of the Amazon, fell 25% after dams were installed along the river, for example. In the area of the Tucuruí dam, also in the Brazilian Amazon, the fish catch fell 60% almost immediately after the dam was built, and more than 100,000 people living downstream were affected by the loss of fisheries, flood recession agriculture, and other natural resources, according to the article. “Most fish species in the Amazon basin are endemic [unique to the region]. The disappearance of these species represents a huge loss to world biodiversity,” Moran said. Climate change will strongly affect the dams that have been built in the Amazon basin in recent years, according to the article. The Jirau and Santo Antonio dams on the Madeira, completed in the last five years, are now expected to produce only a fraction of the 3 gigawatts (GW) they were each designed to generate owing to climate change and the small storage capacity of their run-of-the-river reservoirs. The article also notes that Belo Monte on Xingu, completed in 2016, will produce less owing to climate variability, a relatively small reservoir and insufficient water levels, generating only 4.46 GW instead of its 11.23 GW design capacity even under the best-case scenario. To make matters worse, most of the climate models predict higher temperatures and lower rainfall in the Xingu, Tapajós and Madeira basins. “Depending on water as the main source of power in a future when we’ll have less of this natural resource looks like an unreliable strategy,” Moran said. The authors of the paper stress that, like the effects of climate change, the effects of changing land use on power generation potential are frequently ignored by dam builders. A study by another research group, they note, showed that the power generated in the Xingu Basin, where Belo Monte is located, could fall below 50% of the installed capacity owing to deforestation in the region. This is because deforestation inhibits rainfall and reduces groundwater in tropical rainforest areas. Approximately half of the Amazon basin’s rainfall is estimated to be due to internal moisture recycling. Deforestation will, therefore, lead to less precipitation in the region aside from the expected decline due to global climate change, according to the authors. “Hydro is only one of several solutions to avoid blackouts in Brazil. The best approach is to diversify energy sources and develop innovative solutions that reduce the environmental and social impact of dams,” Moran said. An alternative to traditional dams recommended by the authors is submerged or in-stream turbine technology, also known as “zero head” because no height differential or damming is required. This solution could supply steady power to riverine communities at a low cost and is far more environmentally friendly. Moreover, it does not entail the displacement of local inhabitants or the other social costs of dams. “This technology could be used throughout Brazil wherever there are relatively small watercourses with discharge rates in excess of 1 cubic meter per second,” Moran said.